The present Golden Gate was probably built during the rule of the Moslem Caliph Abd al-Malik – an Umayyad ruler who ruled from Damascus from A.D. 685 to 705. 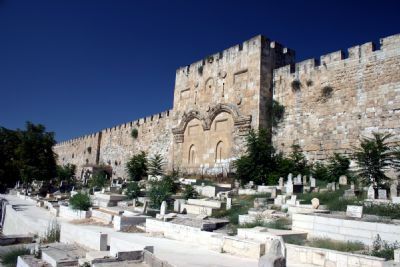 It may have been blocked in the 8th century, but during the Crusader rule in Jerusalem (12th century) it was opened on Palm Sunday (spring) and during the festival of the "Exaltation of the Cross" (September). It was closed after the Crusader era and has remained closed ever since.